Austrian wines have been on a bit of a mini-boom of late, with the world having discovered the unique Austrian speciality, Grüner Veltliner, in a big way. ‘Gru-V’, normally making clean but full-bodied white wines, has been very popular with restaurant sommeliers for its broad-based food matching potential, and has given Austria a presence on supermarket shelves, in many cases for the first time. Like all Austrian estates, I guess that Willi Opitz must have benefited from the Gru-V effect, but this is an estate – and a man – that has trodden such an idiosyncratic path that the fuss over Grüner has probably passed him by.Willi Opitz has garnered critical acclaim worldwide, not only for the very high quality of his portfolio, but for highly individual wines like the flagship Opitz One, a sweet red wine made from air-dried Zweigelt grapes. Other off the wall stunts like the release of a CD at the start of the 2000s that featured the orchestrated sounds of fermentation have raised the profile – and for a short time gave Opitz a hit in the music charts! There is no story here of generations of Optiz’s working the land. In fact, until 1995 Willi Opitz was a mechanical engineer, gainfully employed in middle management with the Mars corporation. With fond memories of home winemaking as a child, he decided to jump ship and leave the corporate rat race, by establishing vineyards and a winery near the town of Illmitz in Burgenland. Initially planting just eight hectares with a range of indigenous and ‘international’ varieties, his site is in a hot and humid area surrounded by over 30 small lakes. This guarantees Botrytis (noble rot) each year and regular production of Beerenauslese, but also entails rigorous work to keep his vineyards healthy. In fact, Opitz tell me that he farms following Biodynamic principles almost exclusively, but expresses some scepticism about the need for ‘official’ Biodynamic certification of his wines: “for some producers its all just marketing bull” he says. Today the estate extends to 17 hectares, with 12 different varieties planted and over 30 different wines in production. “That’s it,” he tells me, “We are at the optimum size now, so no more: this is as big as we get. I have no ambition to go head to head with Bill Gates.” That amounts to just 5,000 cases or so per year in total, and Willi’s determination to hold at that level in order to maintain quality is resolute. Early summer is a crucial time in the vineyards, and Willi tells me he has a team of eight employed on a full-time basis through this crucial season, who are in the vineyards each day to manage the canopy and ensure good sunlight exposure and aeration of the bunches, and to act quickly by spraying with sulphur should there be any signs of mildew.Willi’s daughters now work with him and are the future custodians of the new Opitz wine dynasty. Victoria, after whom Willi’s sparkling cuvée is named, and Angela, a chef who trained with Marco-Pierre White and now runs a catering company with her English-born Fiancée, based at the winery. Willi has an anecdote and a ‘bon mot’ for almost every occasion, describing the process of extracting juice from his extremely desiccated ‘Opitz One’ grapes as like “milking mice,” and putting a little “hand-picked” label on his wines because he wants to tell the world they are “guaranteed frog free.” His tone is a little more serious when he tells me he has abandoned making his ice wine, in the certain belief that climate change no longer endows his area of Austria with cold enough winters to do so. Willi Opitz is a maverick, a great self-publicist and, for all his “I’m a simple farmer” spiel, clearly a very shrewd businessman. 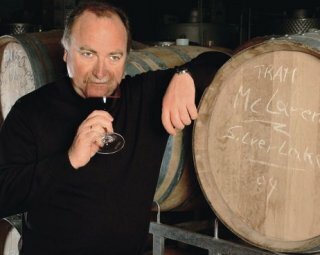 What is also transparently obvious is that he is a gifted and visionary winemaker. There are some stunning wines in this portfolio, and some that blow away all preconceptions of what Austria is capable of. Willi Opitz wines are imported into the UK by T&W Wines. See all stockists of Opitz wine on wine-searcher. Willi reveals that the secret of his dry, pink/bronze-coloured Sekt is that the ‘dosage’ – the liquor used to sweeten traditional method fizz before final stoppering – is his sweet red ‘Opitz One’. Made from Pinot Noir, the nose is filled with soft, strawberry aromas and a cut of lemon. The palate has a rolling, soft mousse with weight and breadth, and a touch of toffee to ripe, sweet red fruits. The core of clean, precise lemony acidity comes through and the finish is long in an interesting and very delicious wine. 88/100. A saignée method wine, made from bleeding off some juice from Willi’s Pinot Noir, this has a deep, bright pink colour. There’s a lovely nose here, with haunting rose-hip and strawberry fragrance and some leafy, herbal notes. The palate brims with lively, fresh, red fruit and a fine citrus acidity. Very juicy and tangy. 87/100. The Opitz Pinot vineyard is eight-years-old and is planted with Burgundy clones, and is filled with plush, smoky aromas and rich black fruit. It has a very nice palate, with a silky texture and a bit of layering thanks to some dry, redcurranty flavours and an underpinning of much plummier, chocolaty fruit. The smokiness and spice of the oak and fruit comes through quite powerfully in the finish, giving this a broad, mouth-filling character with the acidity to freshen the finish just nicely. 90/100. The Silver Lake Merlot endures a severe green-harvesting regime during the growing season, which leaves just six bunches per vine to create concentration and ripeness. It has a cedary, slightly leafy nose, with some richer spices and a plum compote dark fruit character coming through. On the palate the savoury nature of the wine is confirmed, with plenty of acidity that gives a real edge to the plush fruit and spicy, oak-driven tannins, to leave this clean and balanced. 90/100. One of Willi’s most popular wines, the Goldackerl is a blend of Welschriesling and Scheurebe, all Botrytis-affected. It has a beautifully elegant, refined nose, with gently honeyed notes, a touch of talcum powder and a core of sweet nectarine fruit. The palate has real finesse too, with discreet, refined fruit sweetness and a smoky quality. This is not a hugely marmalady or toasty style of BA, but has verve and cut from fine acidity amongst gentle stone fruit sweetness in a long, impeccably balanced finish. 92/100. This red dessert wine made from indigenous Zweigelt grapes was awarded “Wine of the Month” for June. It is dried on straw mats exposed to prevailing winds, from vineyards that yield only 7 hectolitres of juice per hectare of vineyard. Willi likes to compare with Yquem’s 28hl/ha or so. It has a gorgeous, pure, strawberry and rose-hip nose, with some plump sultana notes and a certain mineral quality that is quite schisty and earthy. On the palate it is smooth and silky-textured, with a broad palate of raspberry and blackberry fruit, very refined tannins and that schisty, mineral acidity always present and adding a savoury grip despite the sweetness from 200g of residual sugar. 94/100. £45.77 per 37cl. See all stockists of Opitz wine on wine-searcher.